14 November 2008, at 11:57a.m. US - Salmonella, one of the most infectious food-borne pathogens affecting humans today, had stymied attempts to uncover many of its most potent secrets. Now, researchers are making discoveries that may hold the promise of immunity from disease and a safer food supply. With funding from USDA’s Cooperative State Research, Education, and Extension Service (CSREES) National Research Initiative (NRI), scientists in California determined that human strains of Salmonella are different from those derived from animal sources. Salmonella is most commonly transmitted through consumption of food products that have been contaminated with animal waste. In human patients, Salmonella causes salmonellosis, a form of food poisoning characterized by the sudden onset of abdominal pain, vomiting, diarrhea, and fever. There are more than 2,300 strains of Salmonella. Although antibody-based classification of these strains has been useful epidemiologically, it provides limited information concerning bacterial diversity, evolutionary relatedness, and disease-causing potential. Many of these strains are also becoming resistant to powerful antibiotics. The presence of Salmonella in commercial livestock production systems presents a potential risk to the food supply, and the prospect of a bacterial strain emerging that is more suited to human infection than animal infection is a major cause of concern. Michael Mahan and colleagues at the University of California, Santa Barbara determined that strains of Salmonella collected from human salmonellosis patients are distinct from Salmonella strains obtained from animals. Until now, scientists had not been able to describe the relationship between virulence and the degree of disease-causing potential of animal vs. human Salmonella isolates. However, Mahan’s new research findings could significantly affect the development of treatment methods to reduce food-borne illness in humans. 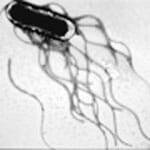 Mahan’s researchers tested in mice the virulence capacities of 184 human and animal strains of Salmonella. Results showed that 21 of 21 strains of Salmonella derived from animals were virulent in mice, compared to only 16 of 41 Salmonella strains collected from human salmonellosis patients. These studies suggest that Salmonella isolates derived from human salmonellosis patients are distinct from those of animal origin. The researchers believe that characterization of these bacterial strain variants may provide insight into the relative disease-causing ability of Salmonella and the development of treatment and prophylactic strategies for salmonellosis. This project brings scientists one step closer to developing a promising live Salmonella vaccine. Such a vaccine would provide a protective immune response across the animal-human realm, resulting in improved animal well-being, a safer food supply, and increased public health.